When the 2020 Jeep Gladiator debuted at the 2018 Los Angeles Auto Show, many complained that the first Jeep truck since 1992 was too big. “I want a regular cab,” the masses of internet truck-diehards yelled in all caps. Well, there’s some good news for them, as last week, Jeep showed off exactly that in the Jeep J6 Easter Jeep Safari concept. Okay, so I should put “long bed” in quotes, because this is only a long bed insofar as its six-foot bed is a foot longer than that of the 2020 Jeep Gladiator. 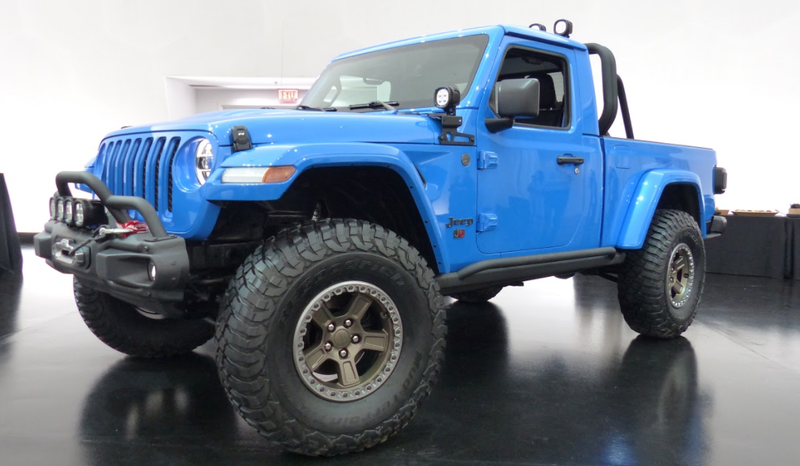 Basically, what Jeep did here is take a Jeep Wrangler Unlimited JL, and replace the back section with a box made of two cut and welded together Jeep Gladiator boxes. That means the wheelbase is the same as that of the Wrangler at 118.4-inches. Overall length is a bit more at 201 inches, but those two figures are about 17-inches and 19-inches smaller, respectively, than those of the new Gladiator. I guess the roll bar-mounted lights do remind me a bit of the J-truck from the Helen Hunt/Bill Paxton movie “Twister,” (and of old Honchos from the ’70s) and the badges have a nice font, but otherwise I don’t see a lot of J-truck-ness. Still, the important thing, here, is that Jeep has built a regular cab Wrangler-based truck, and I, for one, think it’s lovely and needs to enter production so that zero of the thousands of internet complainers can actually go out there and buy one.